Please include names and/or sizes needed to create the item! 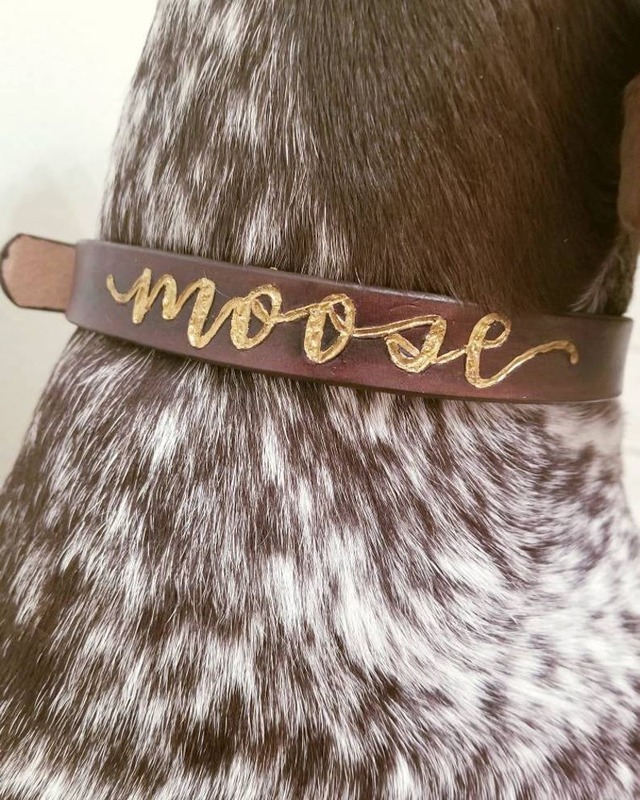 Handmade dog collar , with personalized lettering (this is considered a custom/personlized item, see policies for more). Every leather collar is cut by hand from a leather side, then edged, dyed, burned, and painted by me. Leather sheen and conditioner are used to better protect the leather from elements. Because of the temperament of leather, dye affects each piece differently. Every collar includes a d ring. Small: for 8"-12" necks, collar width is 1/2"
Medium: for 12"-16" necks, collar width is 3/4"
Large: for 16"-20" necks, collar width is 1"
XL: for 20"-24" necks, collar width is 1"
For dogs with 25"+ you may choose from 1-1 1/2"
For special requests (phone numbers, floral design, etc.) please request a custom order! Without a custom order, these special requests will not be added! **I can do different colored paint for the writing, or do no paint at all! *** While the collars are water resistant, they are not water proof. ****D-rings are proportionate, so on the small collar larger leashes may be difficult to attach to. ***** If you'd like a belt loop to secure the extra strap, please indicate so in your order. The belt loop will be attached near the buckle to help secure the leather. I love this collar so much! My dog is comfortable, it is beautiful, and high quality! What are the dimensions of the collars? Please measure your dog's neck to ensure you purchase the correct size! I chose this sizing, based on research of the sizing dogs and my experience! How long do the collars take to ship? It takse me 5-7 business days to make the collars. The process of making the collars is pretty lengthy. I handmake every collar from start to finish. What is the process of making the collars? I start off by cutting a leather side into pieces. Using these pieces I cut the leather into strips for the collars. I shape each piece by curving the edges and add my measurements (the notches, rivet placement, and centering the lettering). Once my measurements are in place, I engrave/burn the names. Next, I dye each piece with an oil based dye. Then, I add edging to every piece (protects the edges of the collar). Next, I make the hole punches, by hammering holes into the collars. I add thread locker to all of the screws and attach the hardware. Then I clean up the lettering (Im a perfectionist). Lastly, I add sheen and conditioner to all of the collars. Almost all of my items are considered custom or personalized orders (any items with names). I do not accept returns and exchanges on these items, unless it is damaged or a mistake was made by me (name spelt wrong, wrong size, etc.). I do not accept returns or exchanges because these items were made especially for you! I cannot resale/reuse these items! My collar seems to have excess leather that sticks out. If the collar is has excess and sticks out, please request a belt loop. I can attach one free of cost! For customers that have already received their collar: I will gladly send you a loop to slip through the collar!